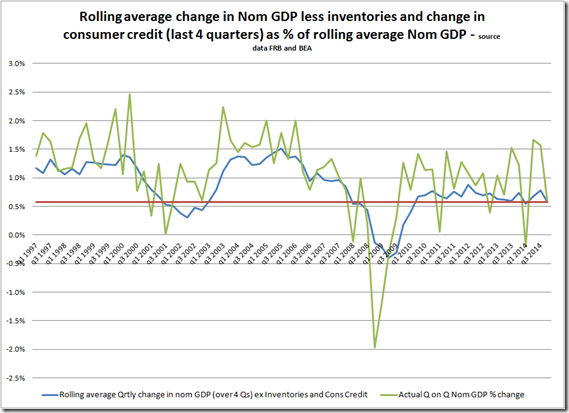 The growth trend is still fundamentally weak, over reliant on consumer credit and exposed to a potential inventory correction. 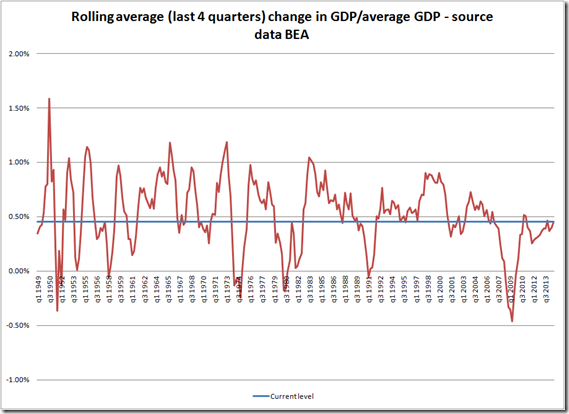 Was the US Q2 GDP revision so great? 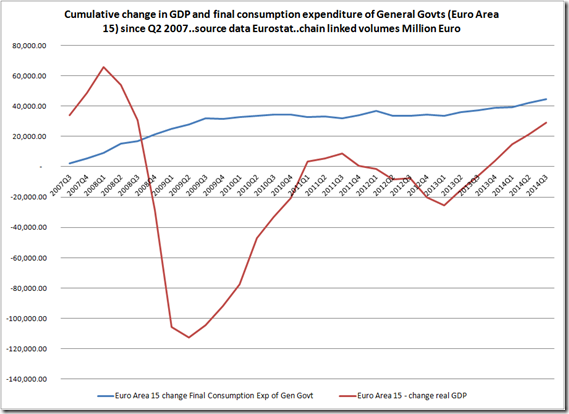 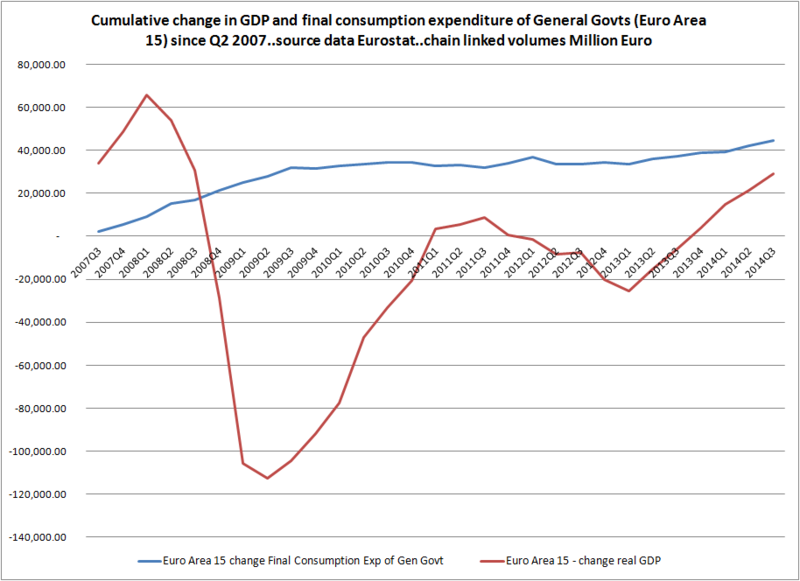 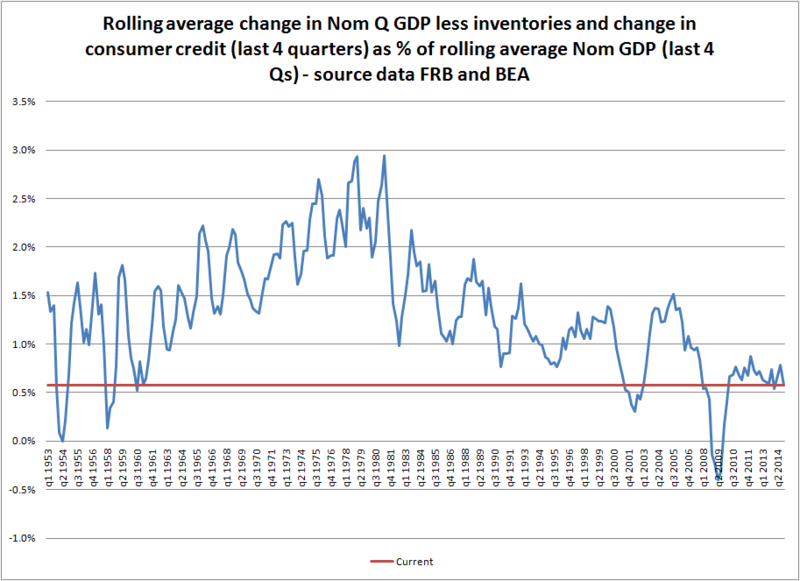 A look at final Q3 GDP..was it really that strong? 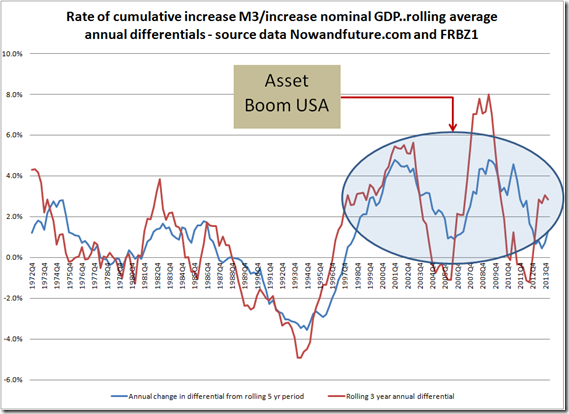 And what of the Frame? 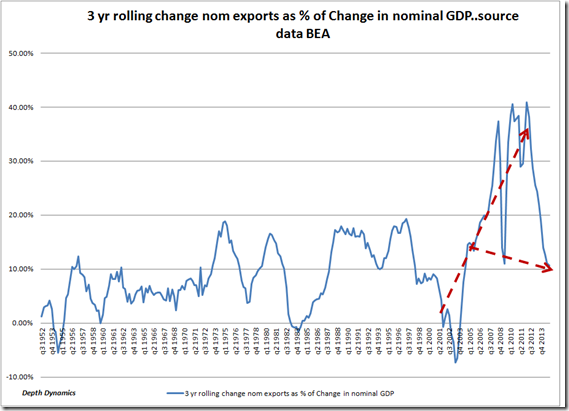 One of the risks with short term data points is being fooled by their randomness. 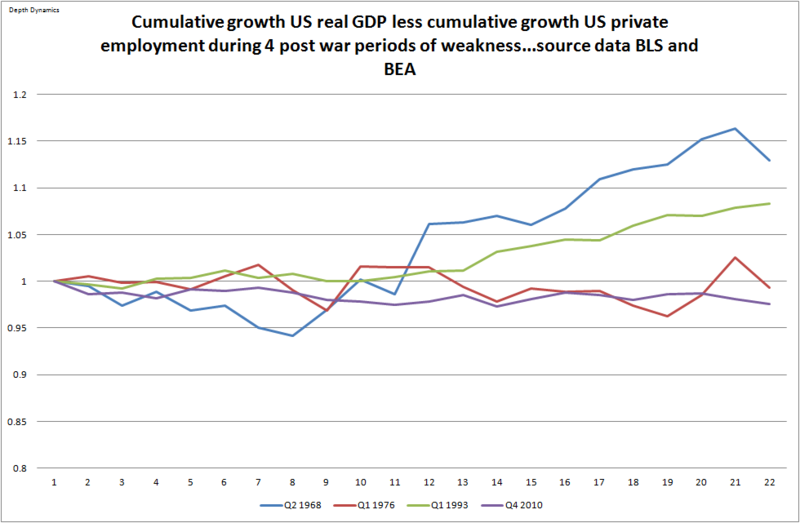 I believe the US economic engine is slowing down and that weight of the past remains a significant head wind! 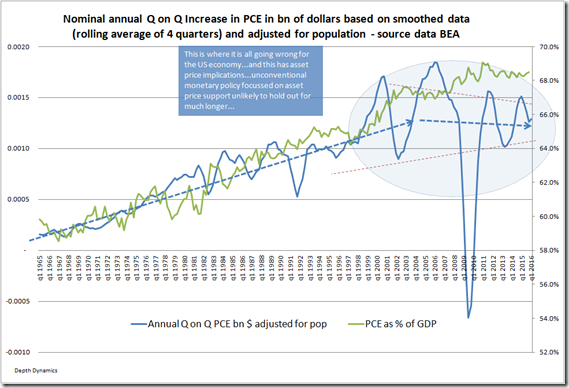 But what of the frame? 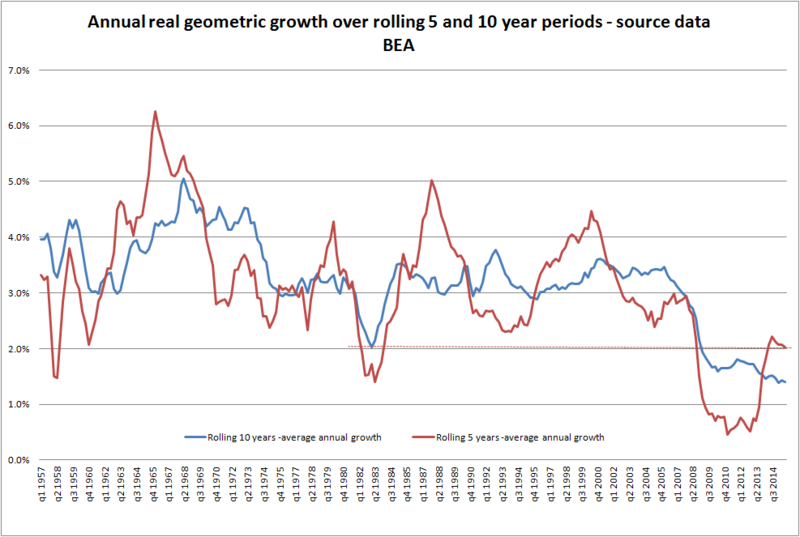 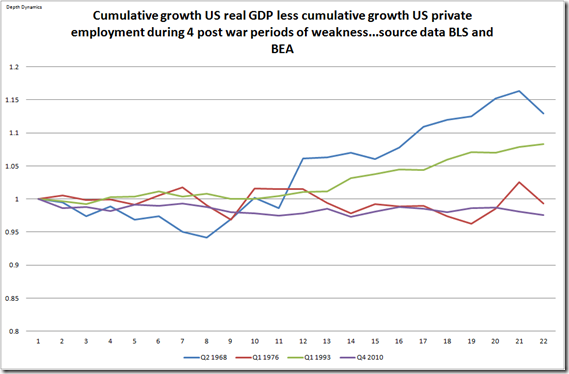 If we look at the average increase in real GDP over the last 4 quarters (average change in GDP over 4Qs/average GDP in prior 4 quarters) we see that real GDP growth is relatively low in an historical context and it is unclear whether the current trend is either a bounce back from earlier weakness or a position of growing strength. 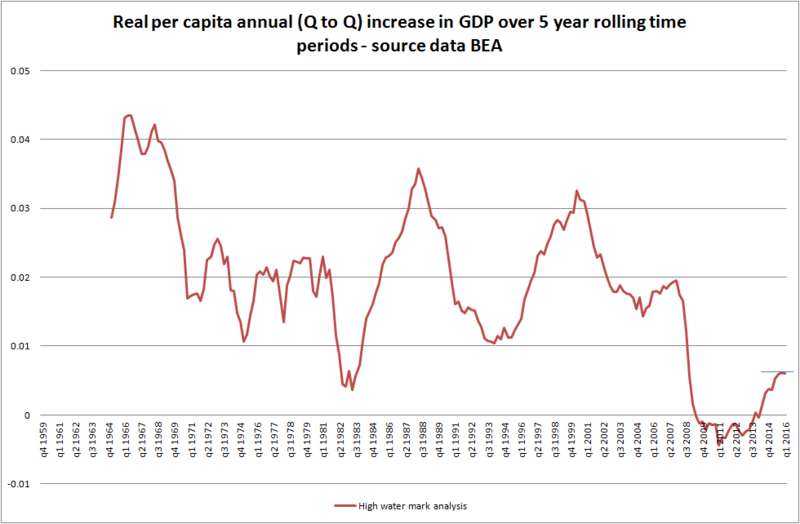 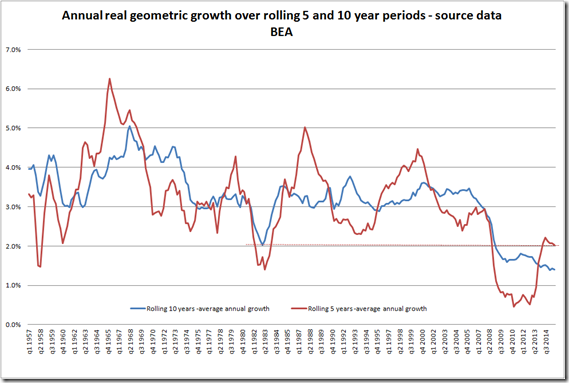 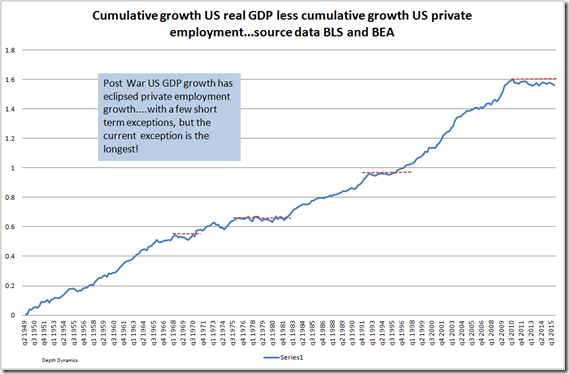 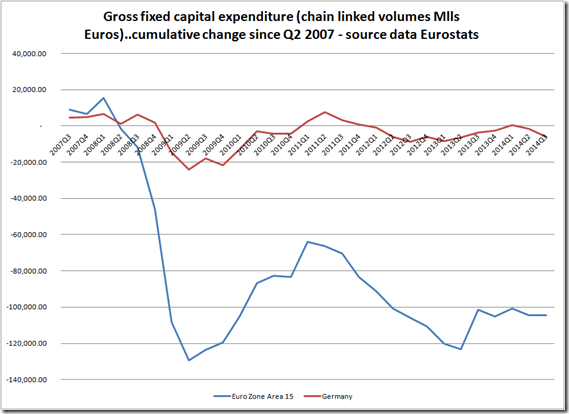 Q1 US GDP–was it an aberration or part of a weakening trend re-established? 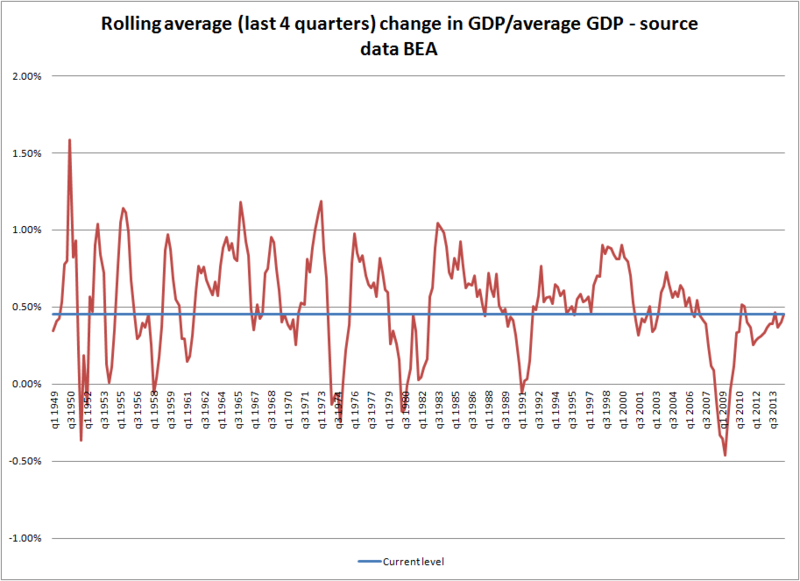 It pays sometimes to wait for the dust to clear: I was just looking at Q1 US GDP. 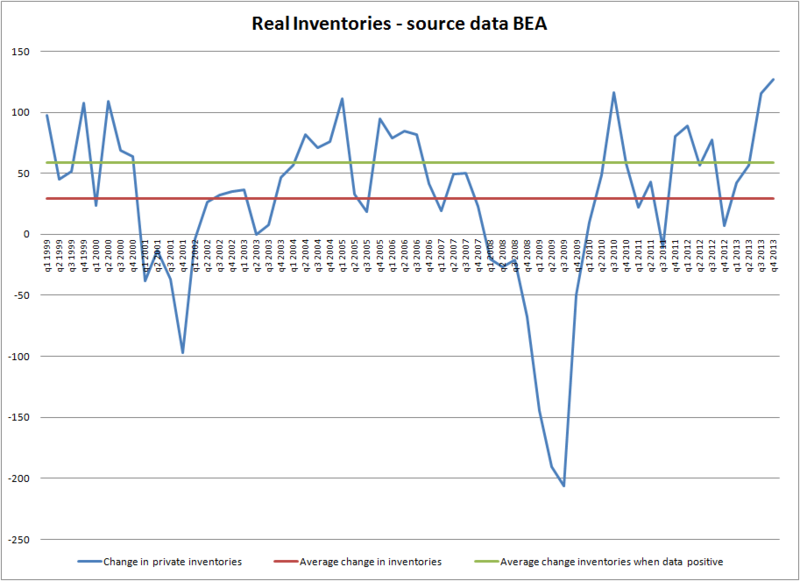 Yes, things can change quite a bit between revisions, but the data is noteworthy as is. 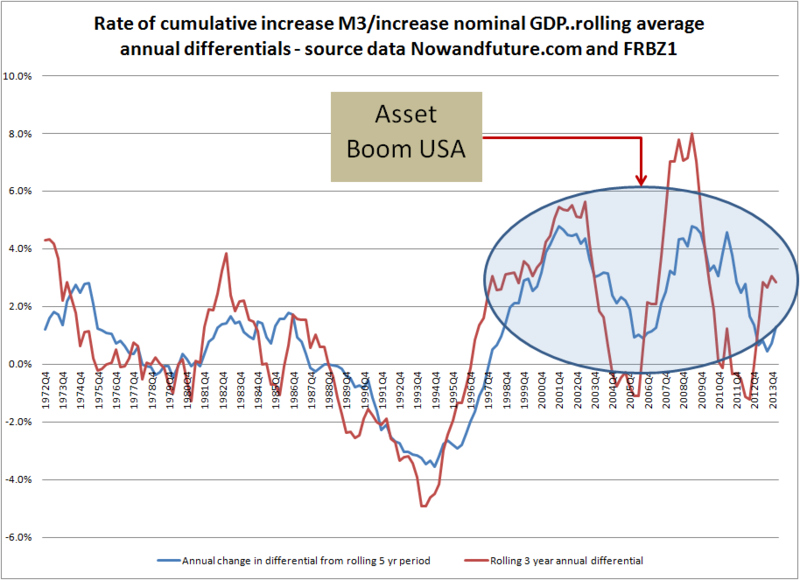 I will touch on some of my views regarding the significance of all this in a later post and there is a disturbing significance. 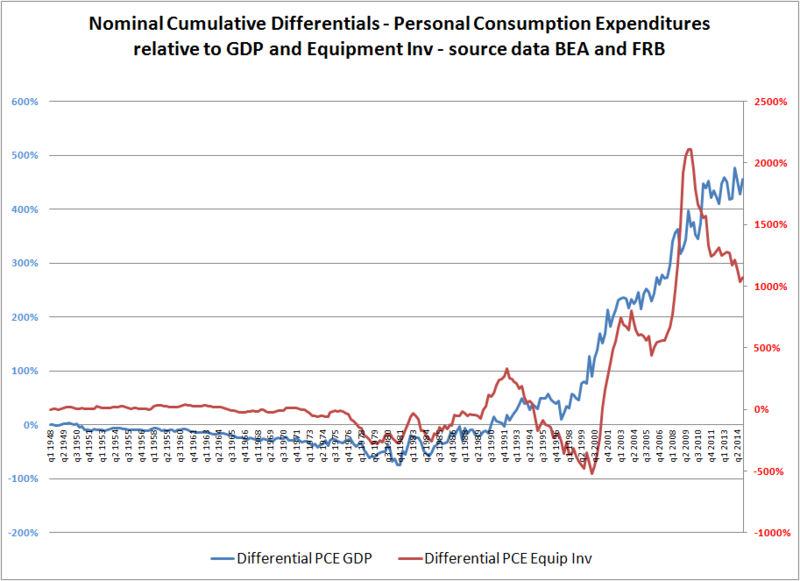 Q4 US GDP (provisional estimate) was helped by a) an increase in personal consumption expenditure that may have more to do with earlier weakness than a strengthening trend, b) a continued rise in inventories and c) a significant increase in net exports (close to 40% of the increase in GDP). 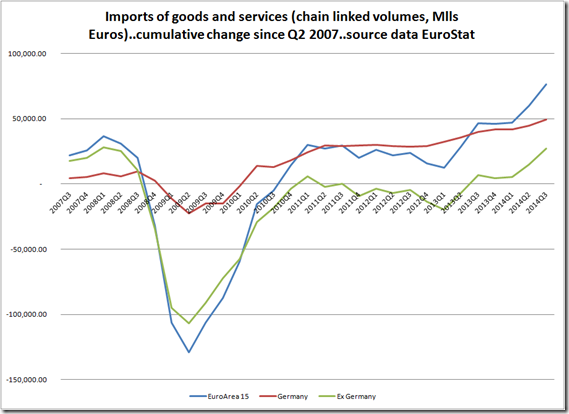 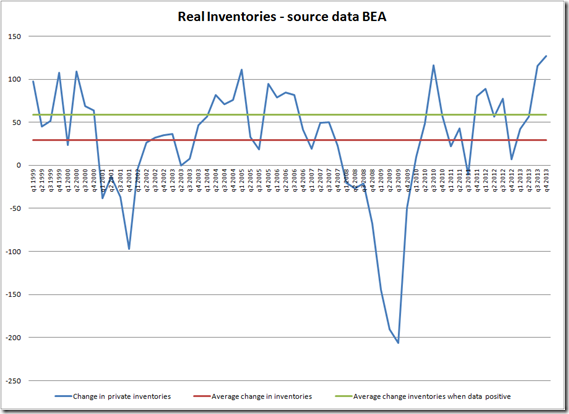 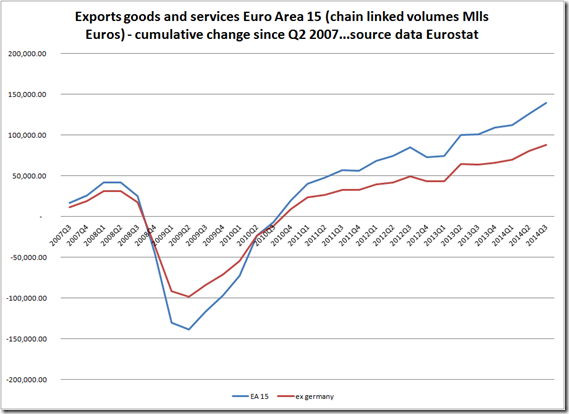 And of course my concern over inventory levels…. 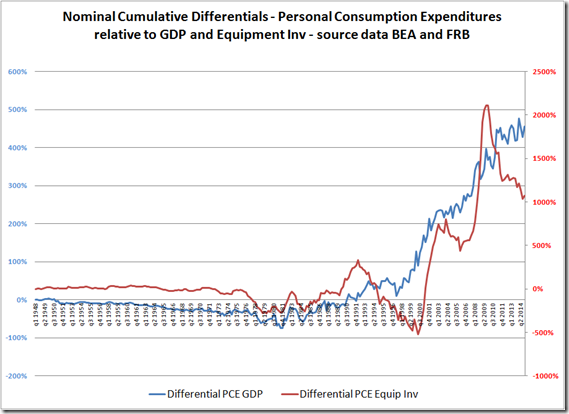 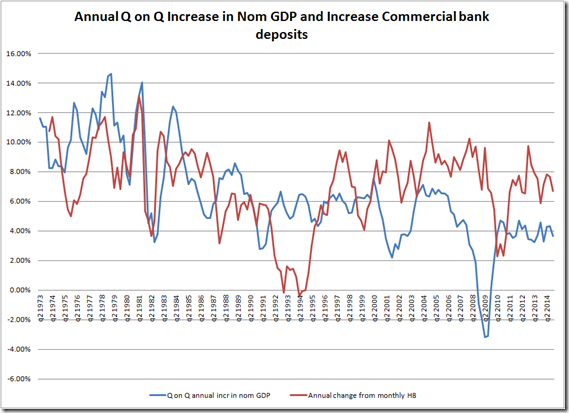 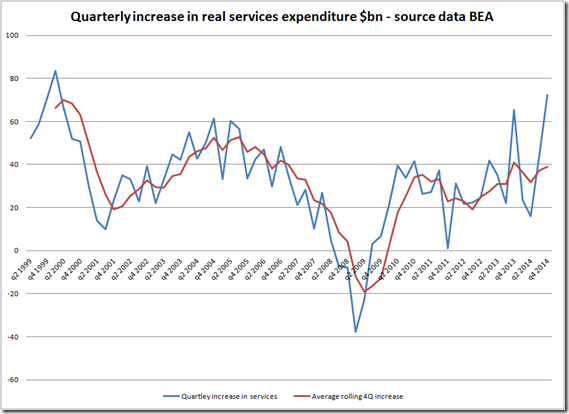 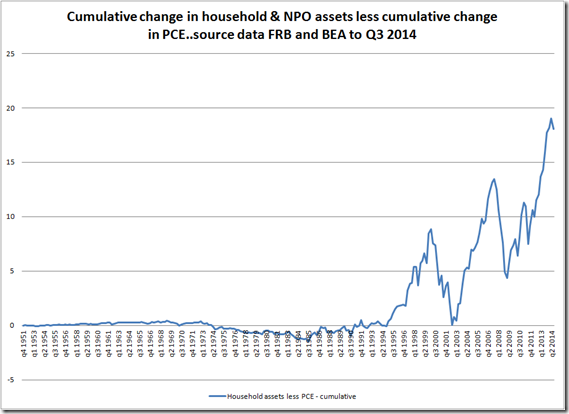 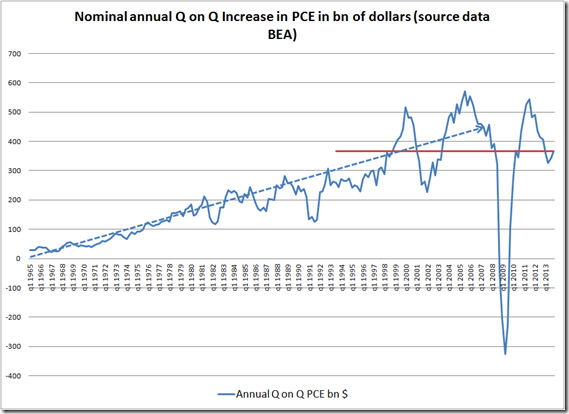 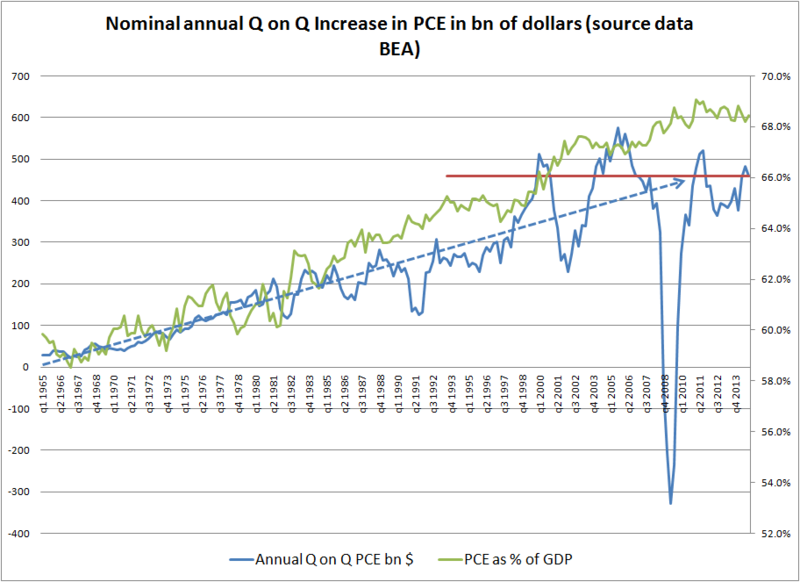 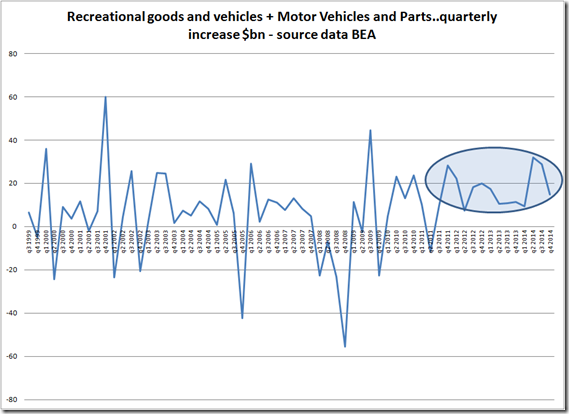 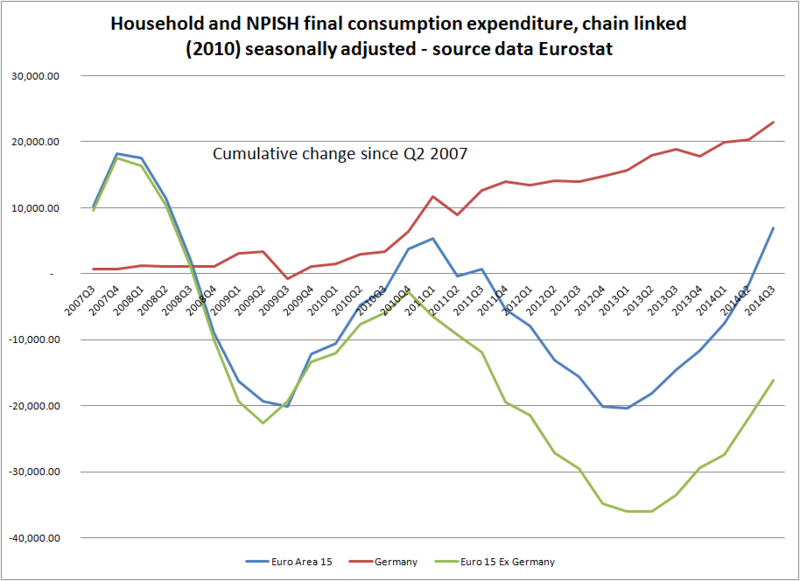 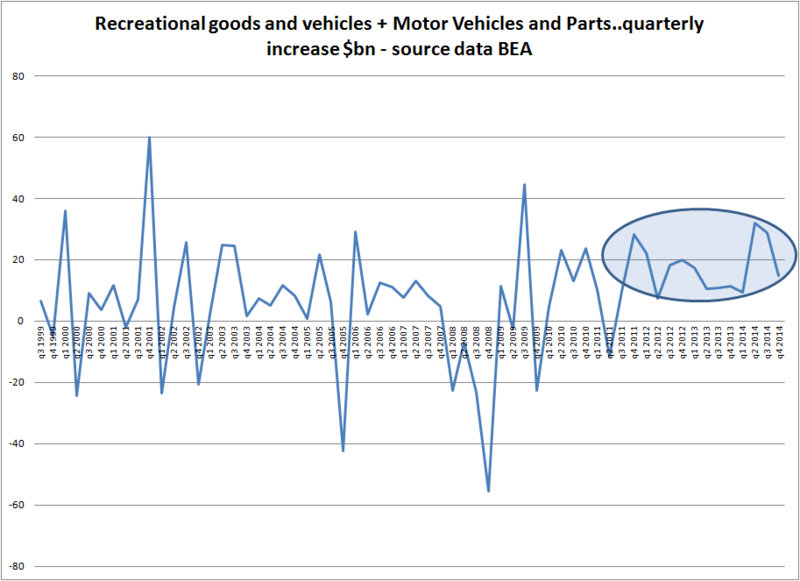 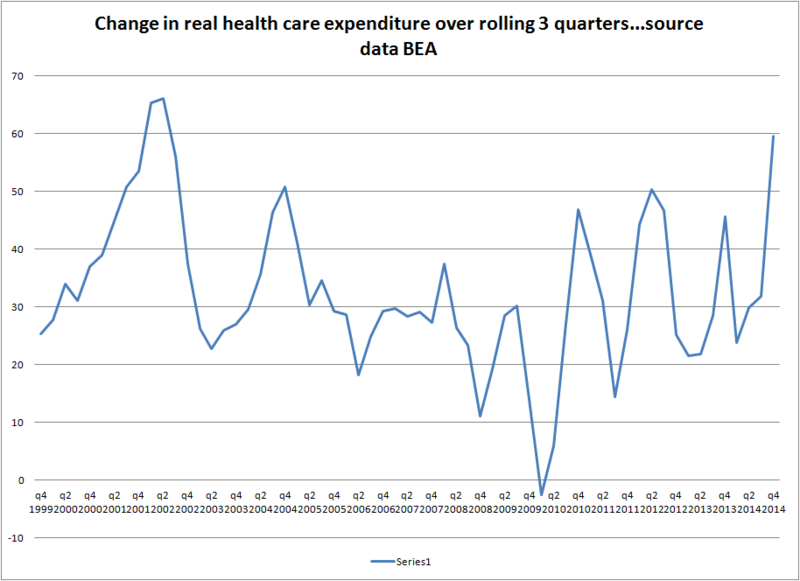 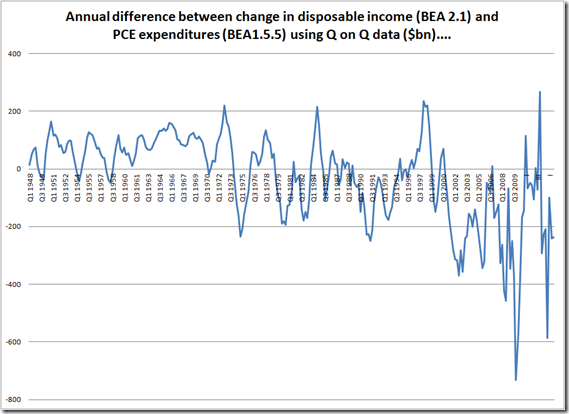 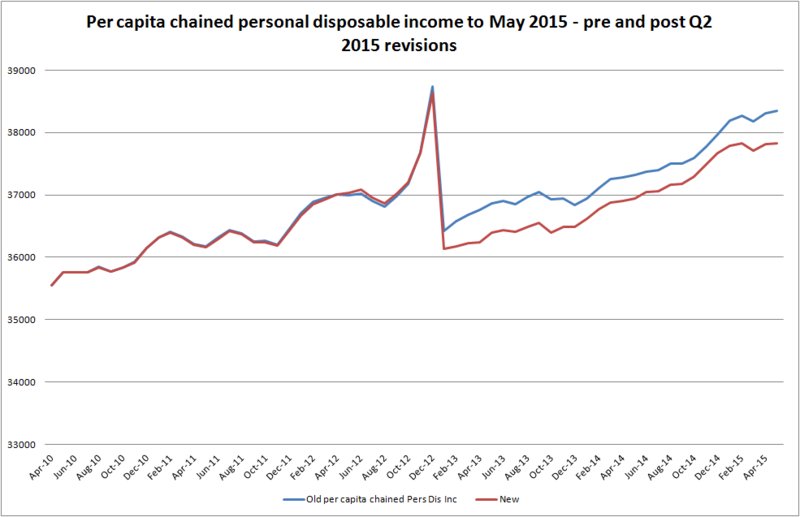 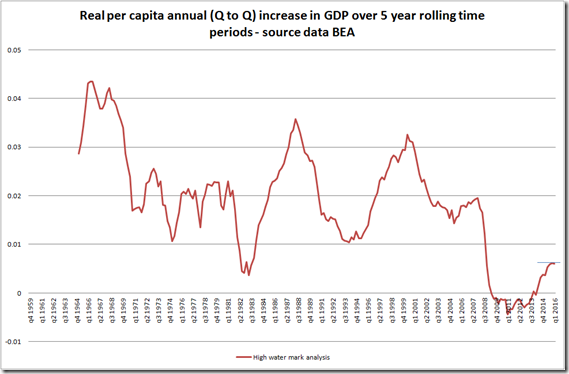 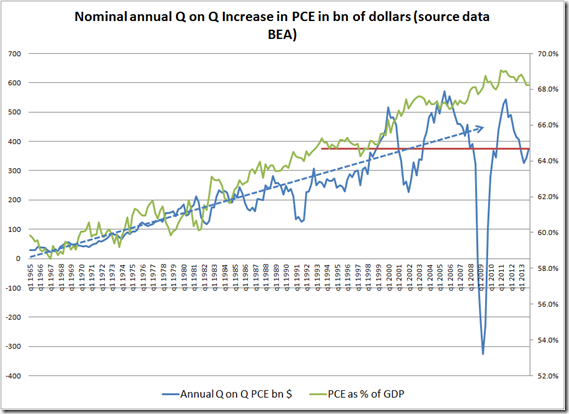 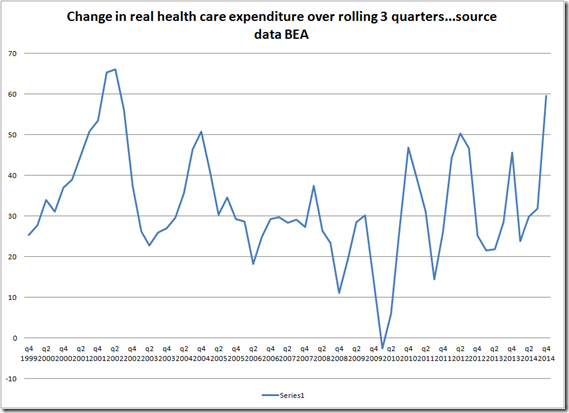 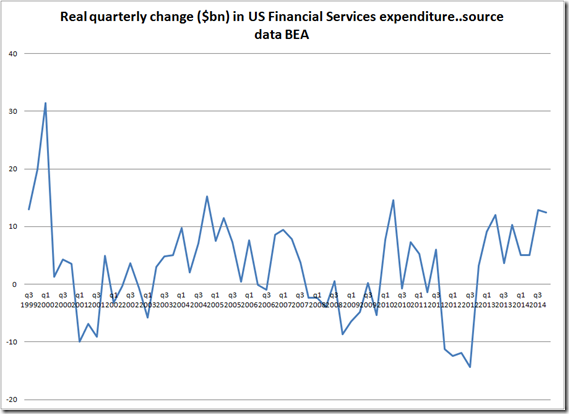 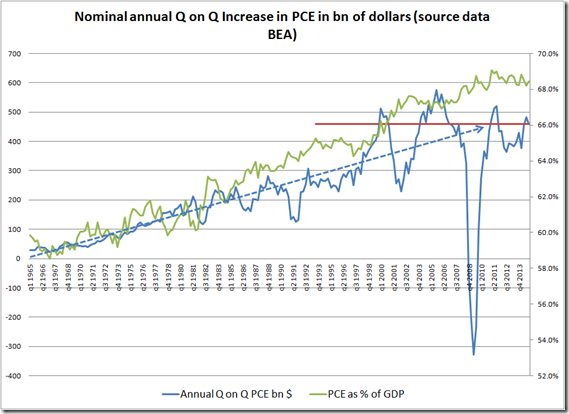 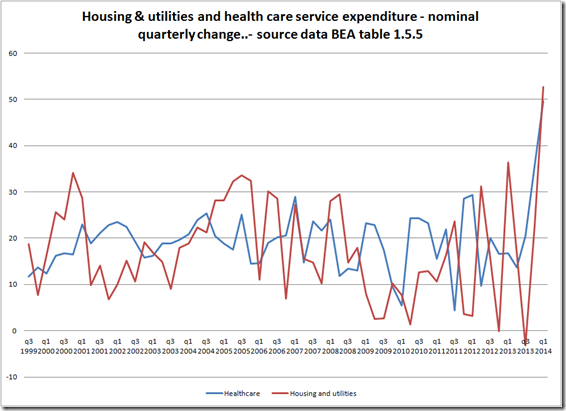 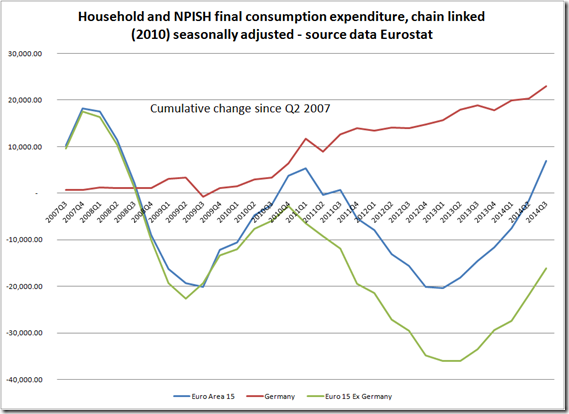 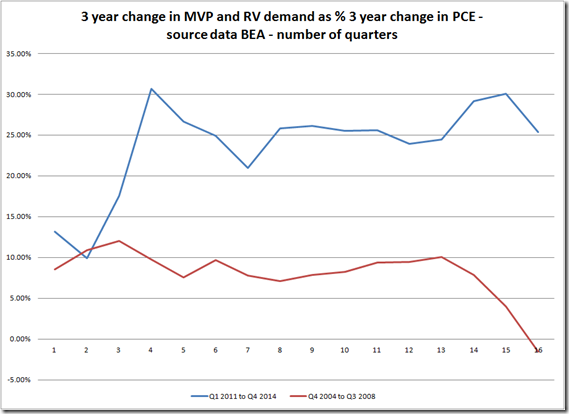 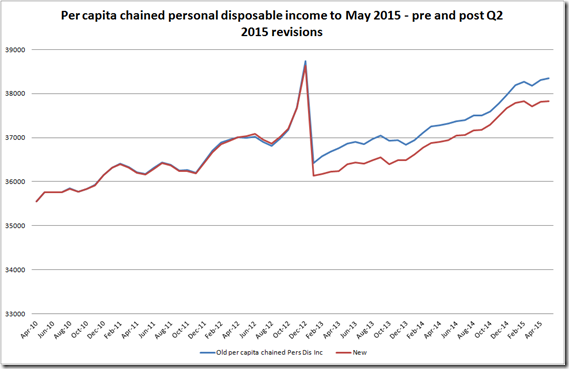 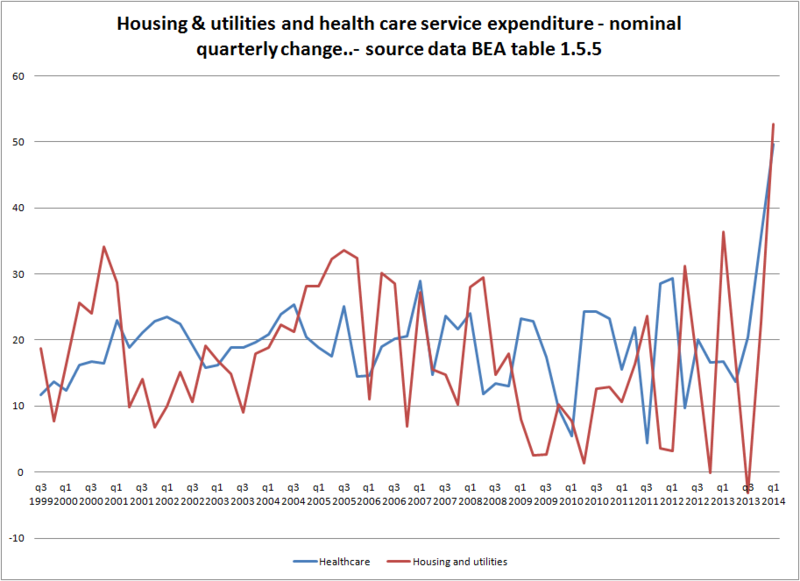 US Q4 GDP–Personal Consumption expenditures at stall speed…. 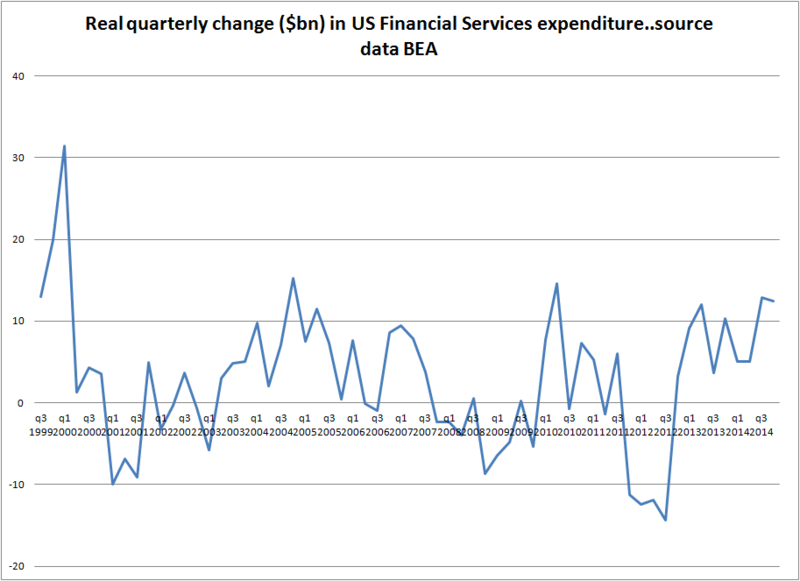 US quarterly growth zooms to 3.6%.. 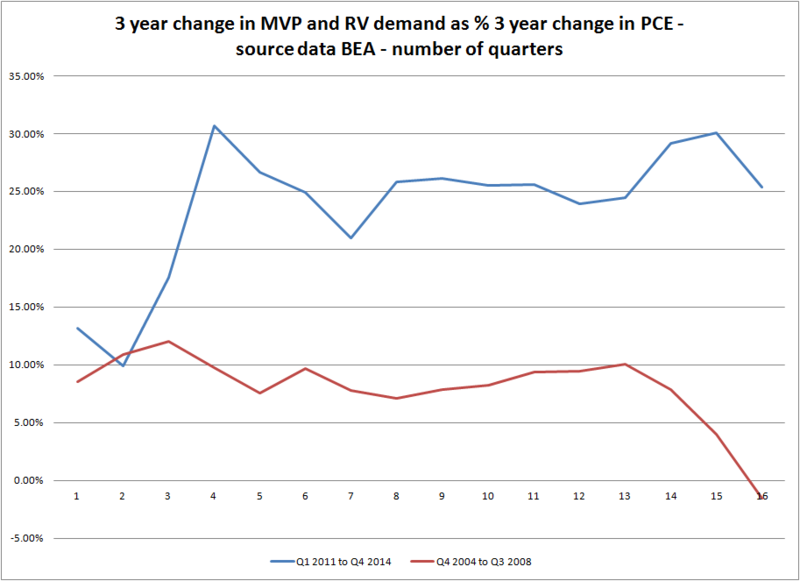 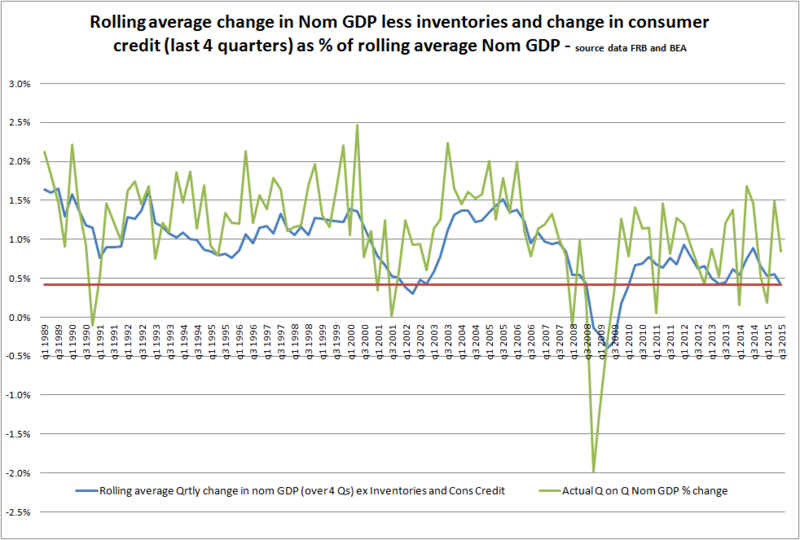 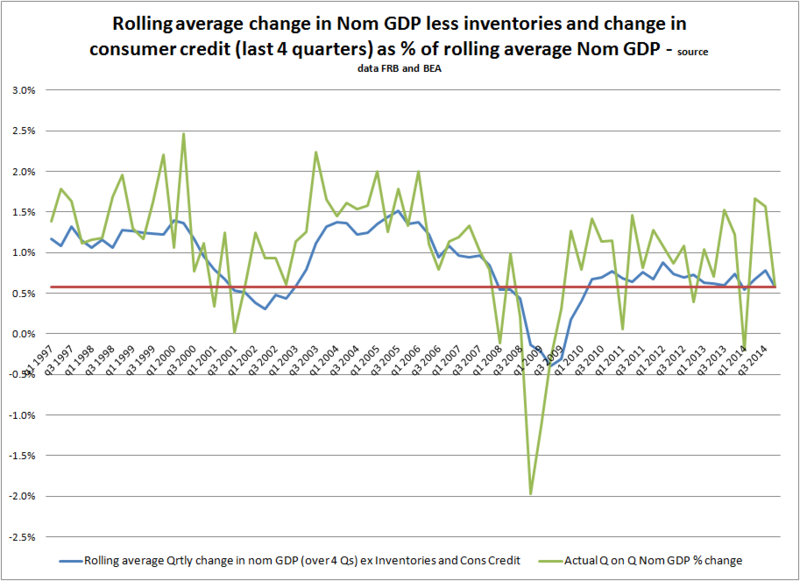 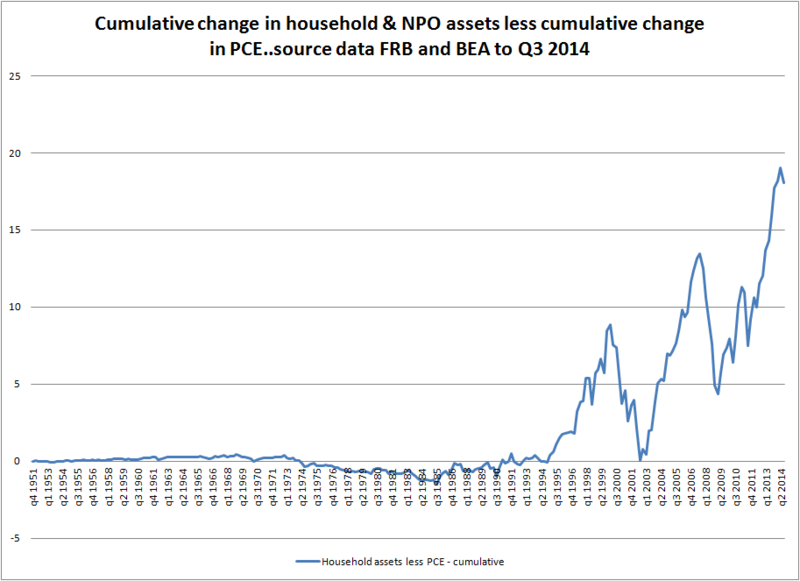 The revision to Q3 data came principally from a rise in inventories over and above those originally reported. 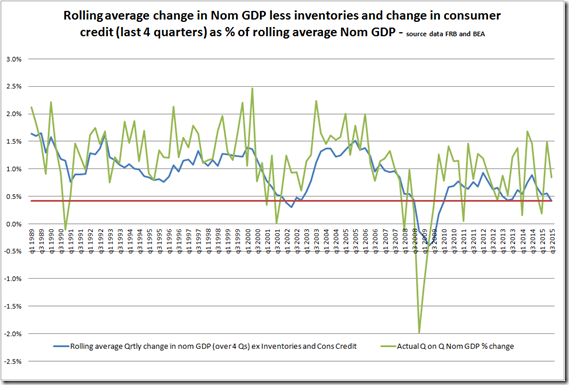 In fact the revision to inventories swamped the upward revision to GDP on both a nominal and a real basis. 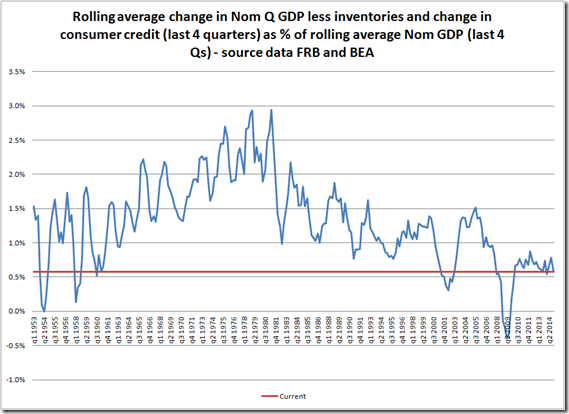 From the start of the crisis it was clear that consumer demand was going to be hit because of debt, and as we moved throughout the crisis through high unemployment and low wage growth. 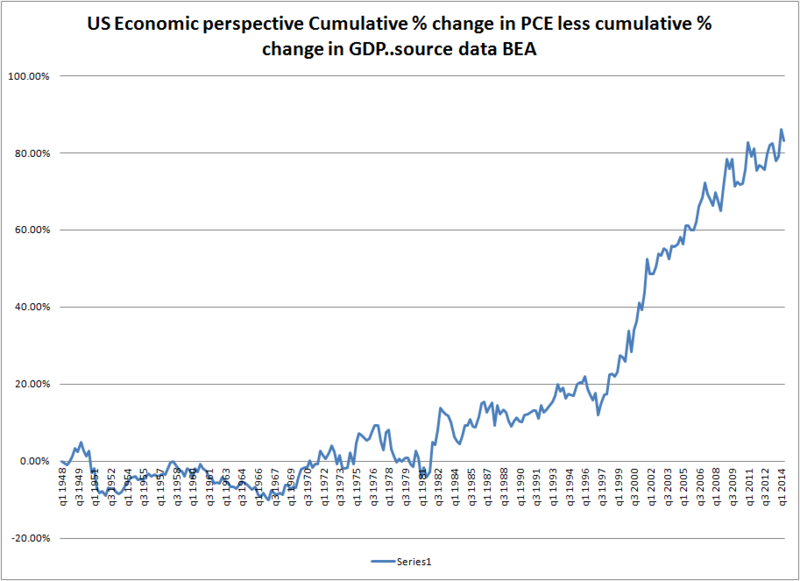 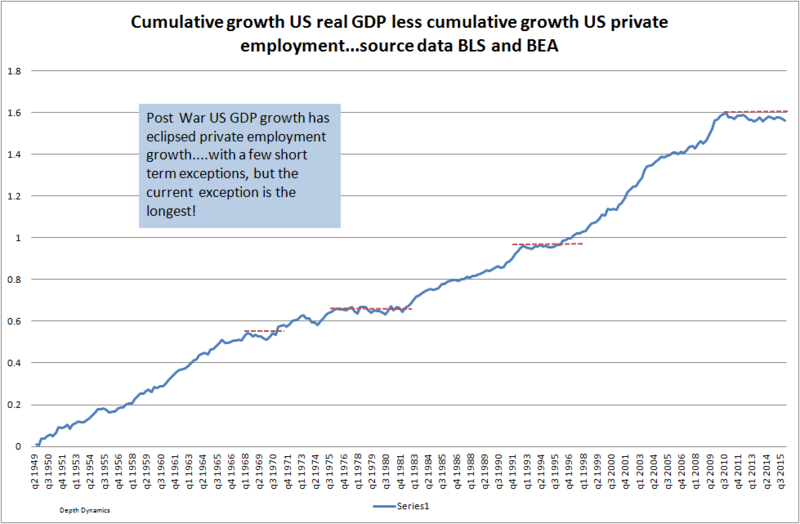 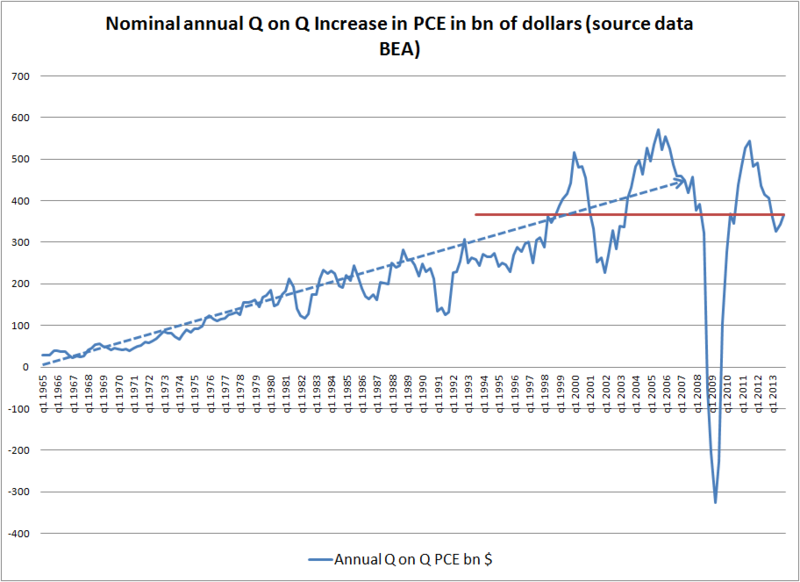 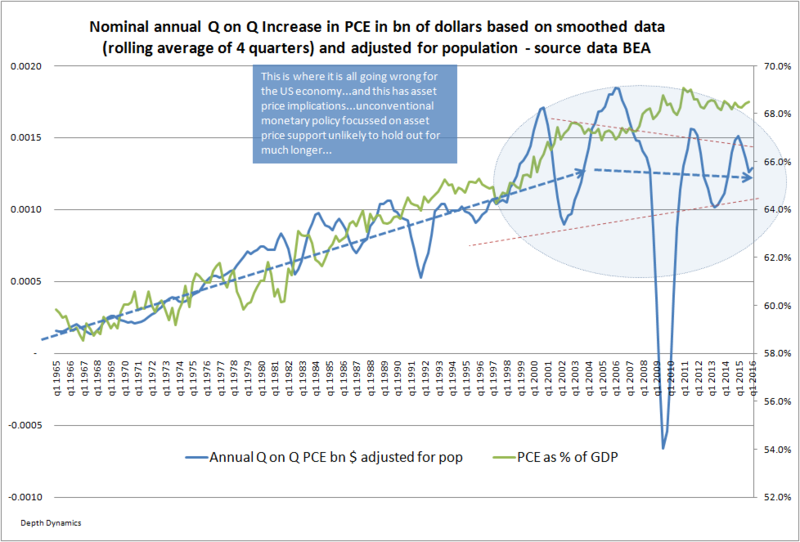 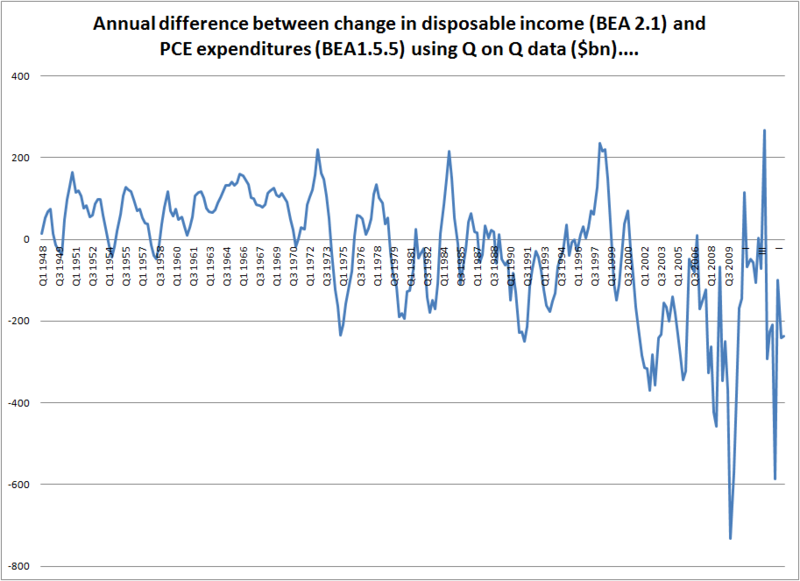 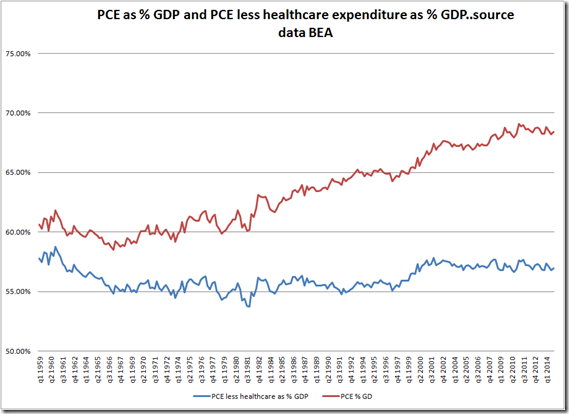 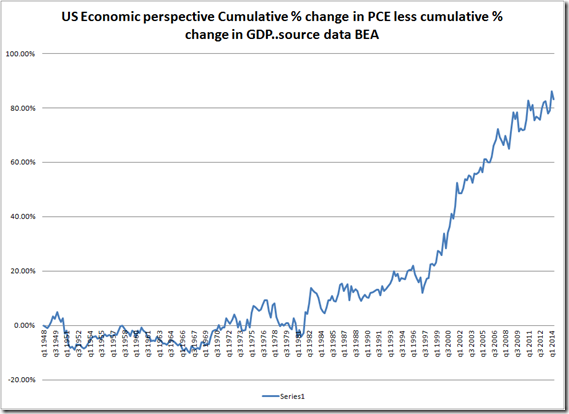 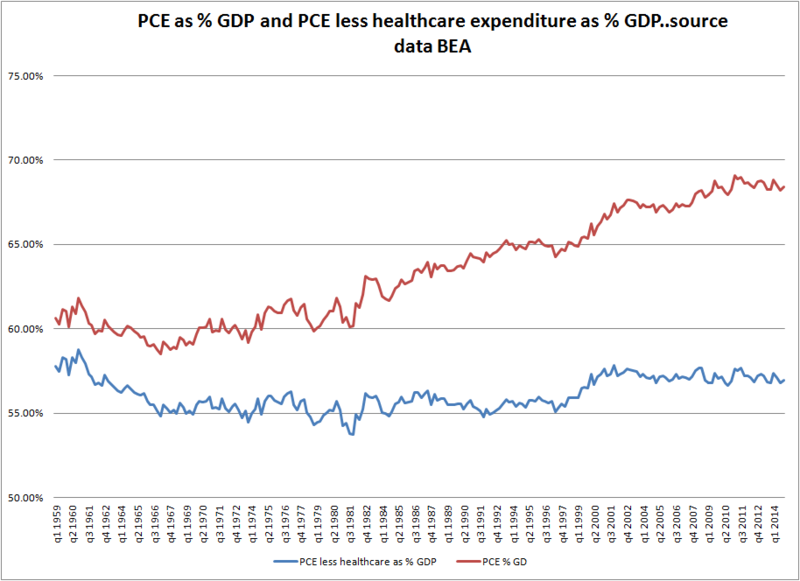 If we were to just look at PCE, you could say the US was close to or in a recession. 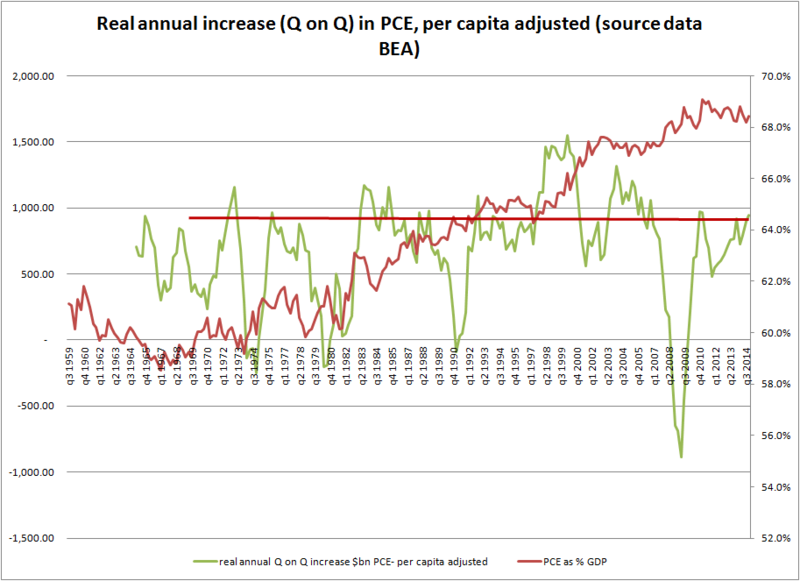 GDP grew at a 2.8% annual rate this quarter, although it is up a lesser 1.65% Q3 2013/Q3 2012. 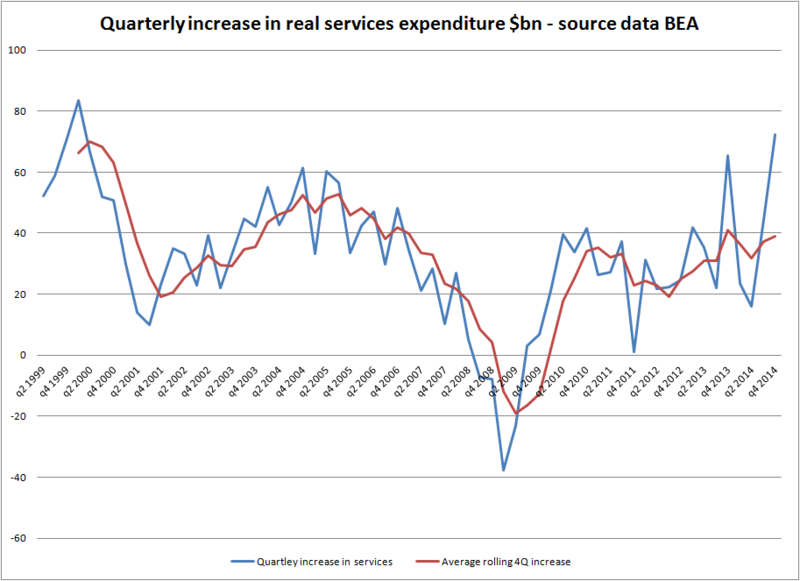 In the quarter growth was aided by inventories and residential structures – excluding these two components growth had risen by 1.63% on an annualised basis. 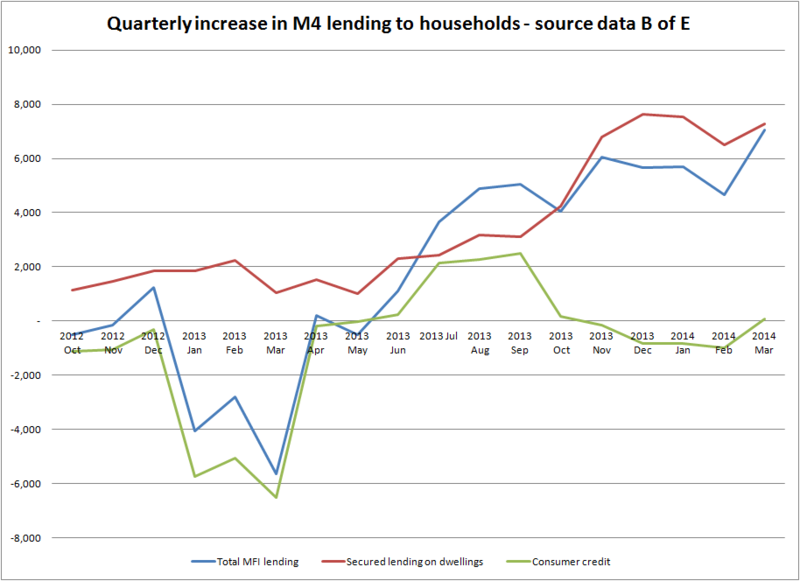 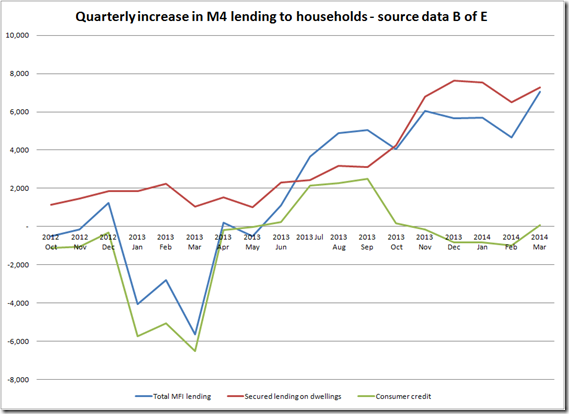 If QE is impacting the demand for residential property, then we cannot rely on headline growth to find out the underlying strength of the economy. 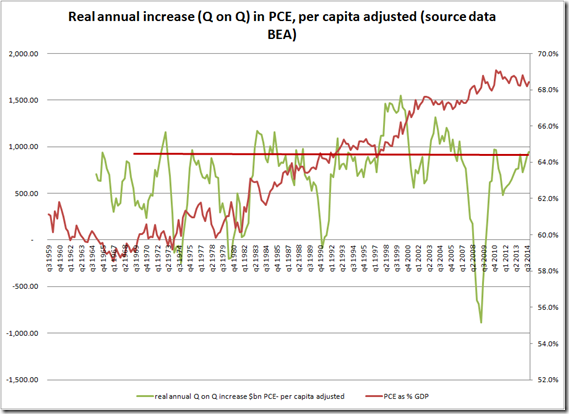 Revisions to revisions: what are the sensitivities? 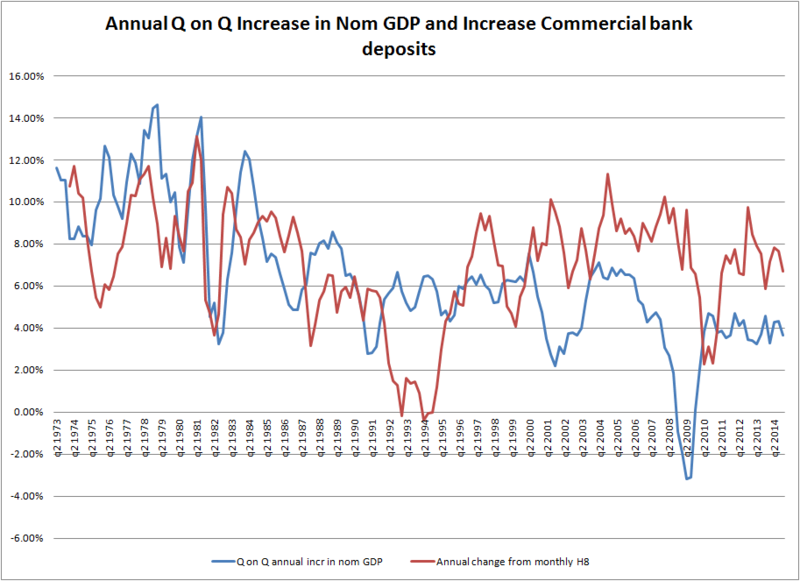 Unsure why the markets are deemed to be reacting to the GDP figure.. 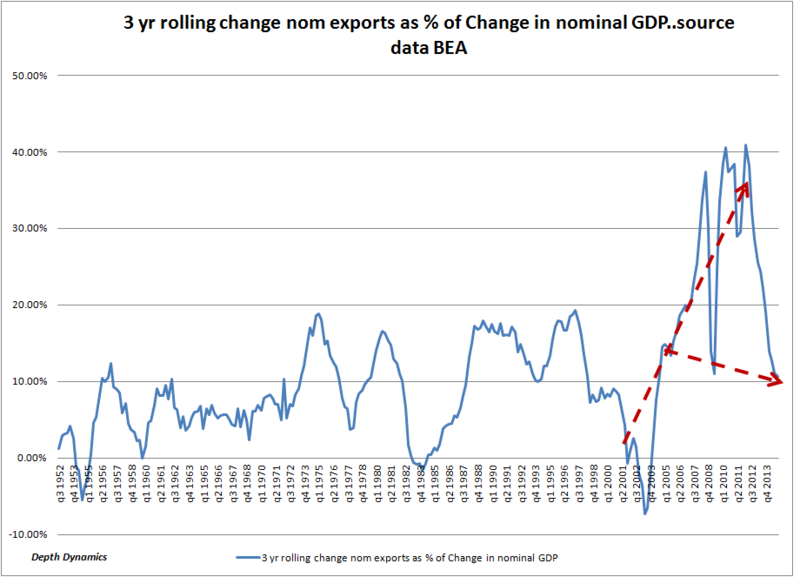 The June export/import figure already suggested a significant revision to preliminary GDP data anyways. 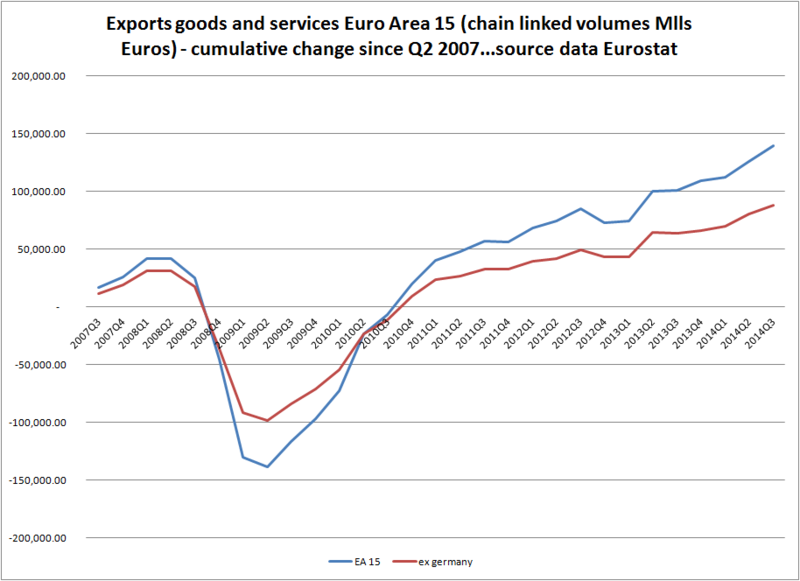 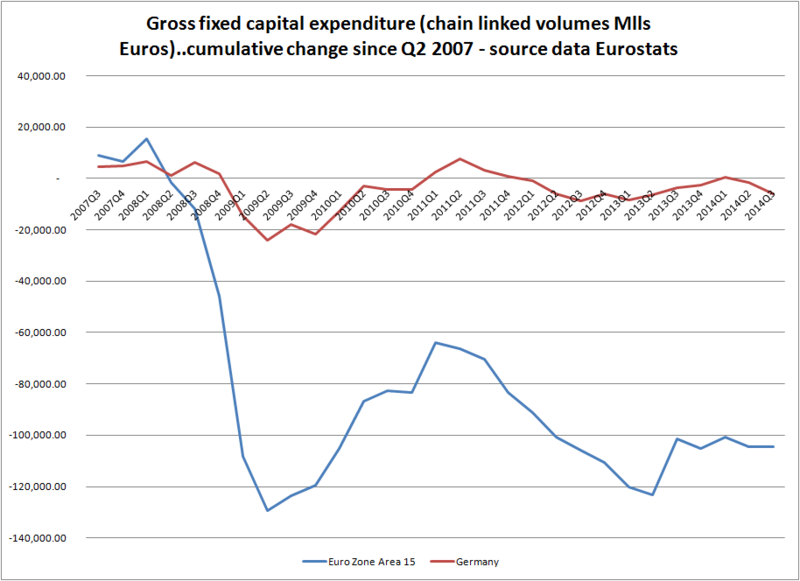 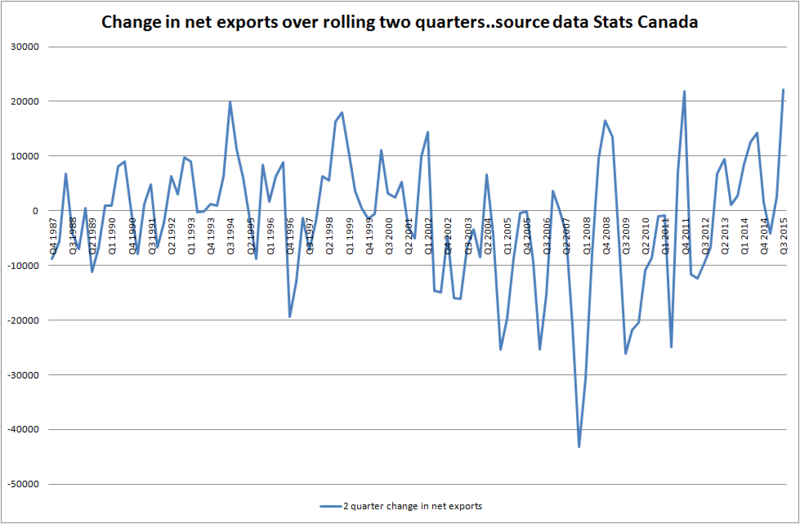 I have already pointed out some basic facts about the trade figures which should soften some of the euphoria. 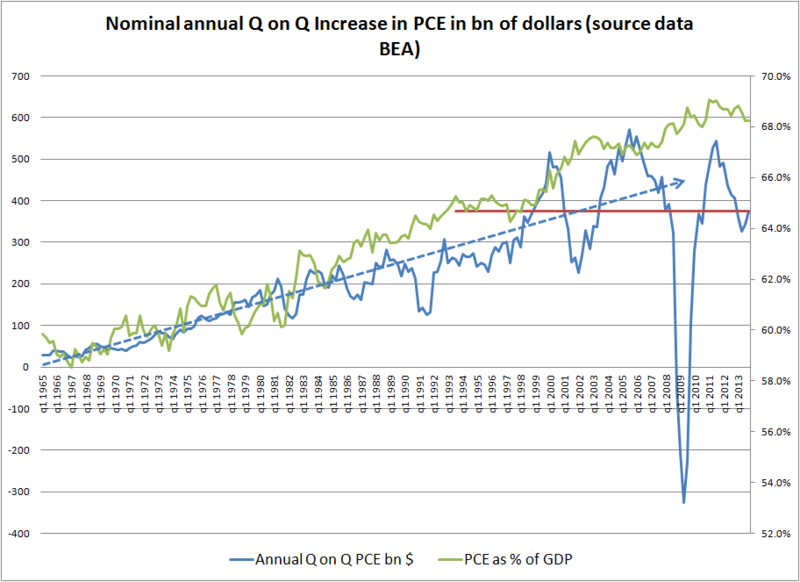 Besides, a 10 point move on the S&P can be attributed to any a number of factors, many of which are random and unrelated to the particular news item, and the money shift required to make such a move is so small that a blink of an eye would sound like thunder in comparison. Bear in mind that this is the first estimate of Q2 GDP: growth looks to have stalled in the second quarter. 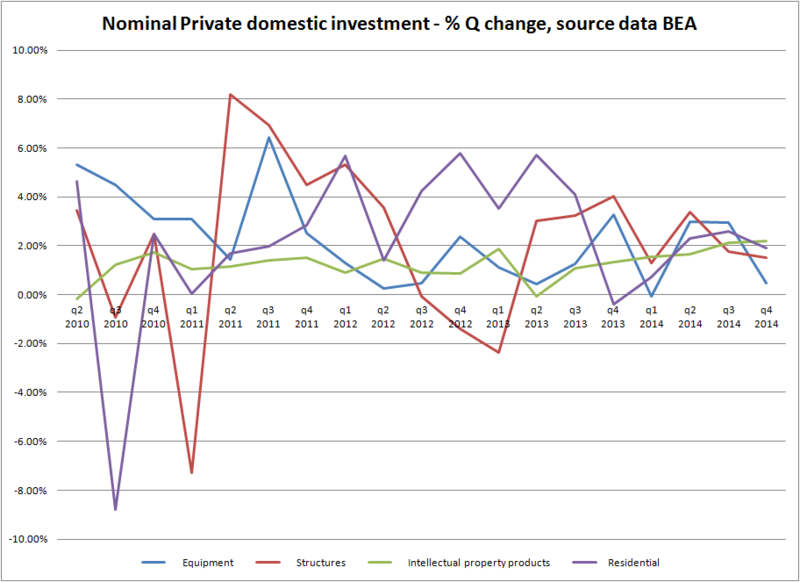 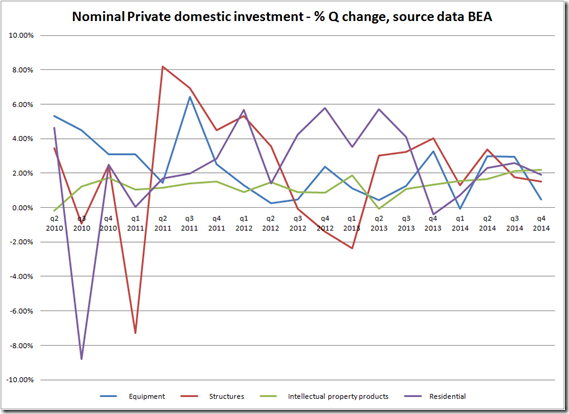 What growth there was, has been largely dependent on the property component of gross domestic investment. 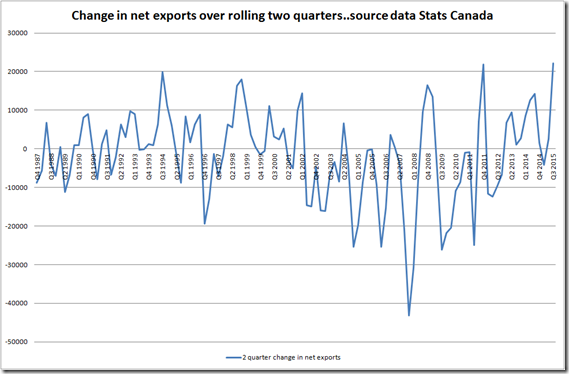 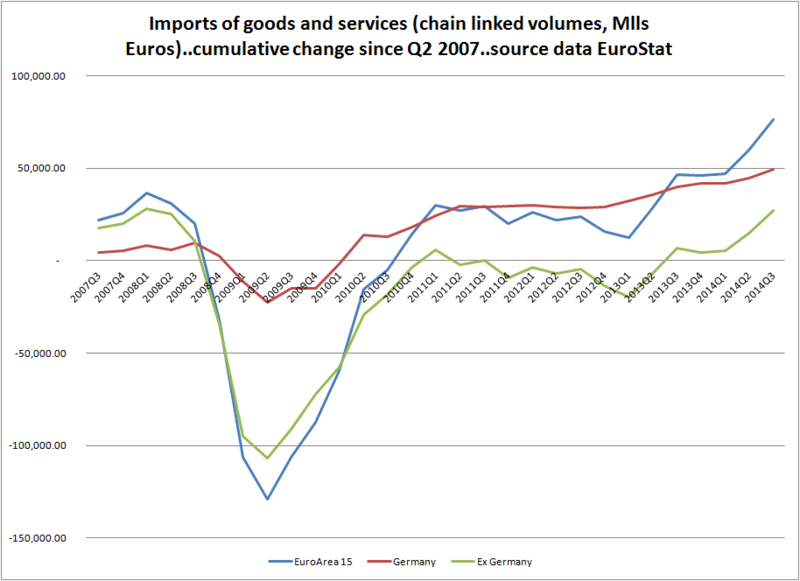 Net exports detracted from growth, although both exports and imports recorded stronger growth – it would be interesting to see how this pans out in future revisions though.